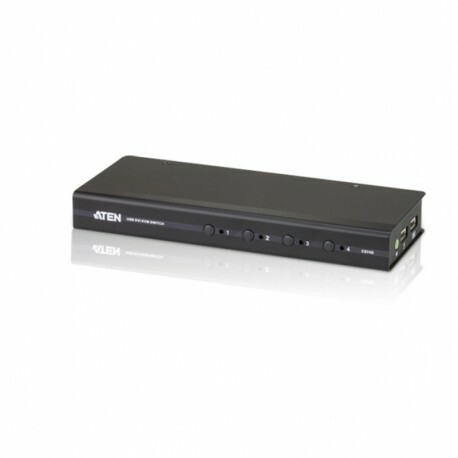 The CS74D 4-Port USB DVI KVM Switch allows you to control four computers using one USB mouse, USB keyboard and Digital Visual Interface (DVI) monitor console. It supports digital video devices, such as fl at panel displays, data projectors, plasma displays and digital TVs. - Fully compliant with DVI specifi cation (Digital only). - Supports multi-function and wireless mouse/keyboard. - Audio enabled – full bass response provides a rich experience for 2.1 channel surround sound systems. - Superior video quality – 1920 x 1200@60Hz. - Multiplatform support – Windows, Linux, Mac, FreeBSD and Sun. - Power on detection – if one computer is powered off, the switch will automatically switch to the next powered-on computer. - Video DynaSync™ – exclusive ATEN technology optimizes display resolution and eliminates boot-up display problems. - Computer selection via front panel pushbuttons, hotkeys, and mouse switching function*. - USB 2.0 mouse port can be used for USB hub and USB peripheral sharing. - Complete keyboard emulation for error-free booting. - Mac/Sun keyboard support and emulation**. * Mouse port switching is only functional under mouse emulation mode and USB 3-key wheel mouse. ** PC keyboard combinations emulate Mac/Sun keyboards; Mac/Sun keyboard work only with their own computers.